After news broke yesterday of King Juan Carlos of Spain's upcoming abdication, how could we pick anyone else for our June Magpie of the Month than the woman who has supported him for more than forty years, Queen Sofia? Today, we're looking at the grandest tiara in her current collection -- the Fleur-de-Lys Tiara, which will no longer be hers when the abdication is complete. The Fleur-de-Lys is the most impressive tiara that the Spanish royal family possesses -- in fact, the longtime family nickname for the piece is "La Buena," or "The Good One." Through decades of upheaval, they’ve managed to hang on to the good one, and it’s graced the heads of three of the first ladies of the land. In fact, only three women have ever worn this tiara in public. The first was Princess Victoria Eugenie of Battenberg, better known to history as Queen Ena of Spain. When she married King Alfonso XIII in 1906, this tiara was her gift from her new husband. 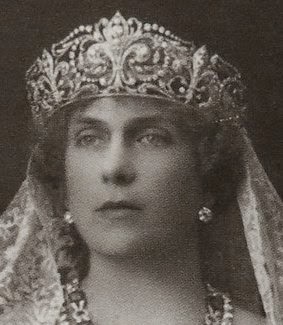 The all-diamond diadem had been made for the new queen by Ansorena, and she wore it on her wedding day. It was an appropriate choice, as the fleur-de-lys motif that dominates the tiara is also the symbol of the House of Borbón. Originally, the piece was a closed circlet (as you can see in the portrait of the young queen above), but shortly afterward, Ena had the tiara converted into the more open form we’re used to seeing today. I've also read that the conversion allows the tiara to be worn either open or closed, though it's not been worn as a closed circlet since Ena's time. Ena was quite generous with her jewel collection, frequently loaning major pieces to family members, including her daughters. But not La Buena — that one was reserved for her own personal use. In fact, she only loaned the tiara to one person during her lifetime: her daughter-in-law, María Mercedes, the Countess of Barcelona. 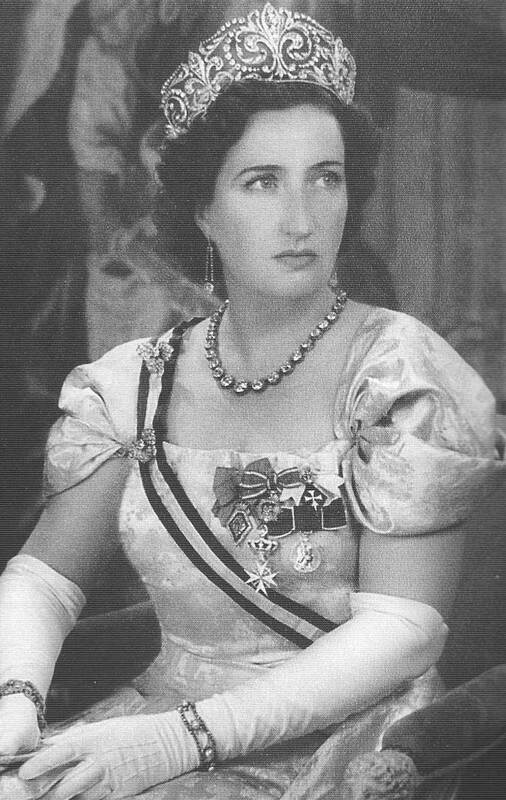 Had the revolutions and civil wars of the early twentieth-century not resulted in a temporary cessation of the monarchy in Spain, María Mercedes would have become queen in 1941. Instead, she and her husband, Infante Juan, never ascended to the throne; their son, Juan Carlos, would eventually become the next Spanish king. But Queen Ena offered her daughter-in-law the chance to wear a queen’s tiara anyway, lending it to her to wear at the coronation of Queen Elizabeth II in 1953, among other occasions. 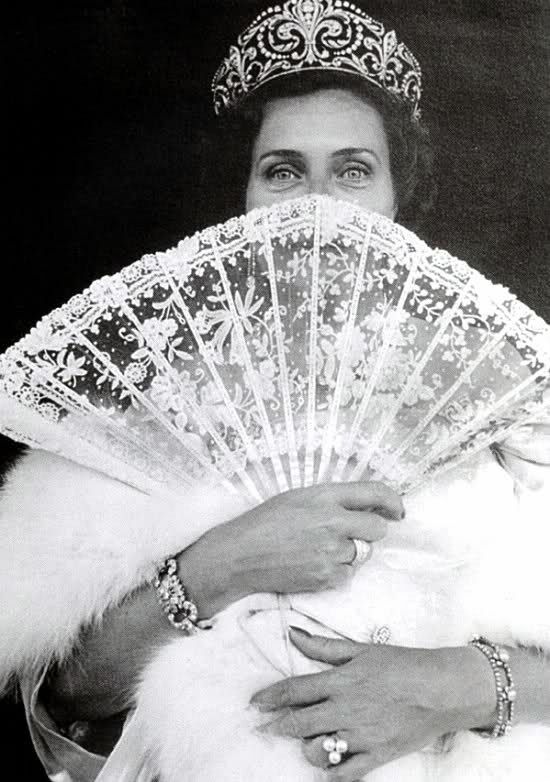 When Ena died in 1969, she bequeathed the tiara to her son, the Count of Barcelona. But she did so with a caveat: the tiara was earmarked specifically for the use of Spanish queens. 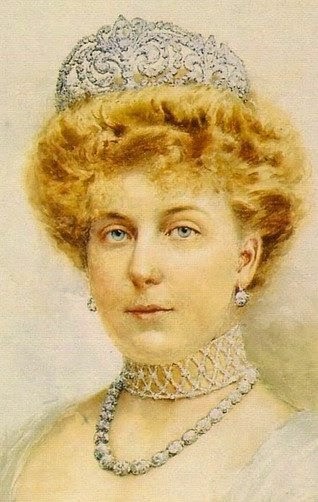 (Also reserved for the use of the Spanish queen in Ena's will, and therefore being transferred to Letizia's collection soon, are Ena's diamond collet necklace, a pair of diamond earrings, a pair of diamond bracelets, and a number of pearl pieces, including a copy of the famous La Peregrina pearl pendant.) The next wearer, accordingly, was Queen Sofia, the wife of King Juan Carlos. She has worn the tiara, which somehow manages to be both imposing and delicate at the same time, on important occasions throughout her husband’s reign. The next wearer of the piece will be Sofia’s daughter-in-law, Letizia. She will become Queen Letizia of Spain when the government approves the king's abdication, likely within the next four to six weeks. It's a bit difficult for me to imagine what La Buena will look like on Letizia, as she is petite and tends to favor sleeker looks. But ultimately, we may not see this tiara on the new queen for a long time. With Republican feelings swelling on the heels of the abdication, La Buena and the rest of the most glittering Spanish jewels might be tucked away until the country is in a more stable and prosperous state.